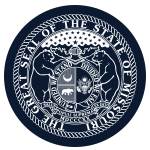 Mission: To ensure that Missouri’s early childhood programs and services are comprehensive, coordinated, accessible, adequately funded and of the highest quality to meet the needs and to promote the well-being of all young children and their families. This can be accomplished by (a) developing key partnerships, (b) building collaborative strategies and (c) ensuring equal access to necessary resources, resulting in the implementation of an effective and sustainable early childhood system. Number of meetings: 4 meetings a year in person in Jefferson City. Term length: Members serve at pleasure of the Governor. Compensation: Members of the board shall serve without compensation but may be reimbursed for actual expenses necessary to the performance of their official duties for the board.